As "Super Championship Weekend" approaches, you may be getting your ducks in a row to watch take in all of that sweet, (mostly) home-grown #content. If you have Sportsnet One and Sportsnet 360, you'll be fine. If not, there's CIS-SIC.tv. But you've been warned: there's a paywall (again) for the semifinals and finals of all the games. Each tournament costs $6.95. Dale Stevens's Canadian University Basketball Discussion List email thread reminded me of the fee and he questioned the logic behind the paywall. He got me thinking, so I asked the CIS about their policy and, well, their hands are tied. The league confirmed, via email, that Sportsnet says they must charge for the livestream. At first blush, I get it. Sportsnet wants people to subscribe to their channels and they don't want fans going online and getting the content for free. Who is going to buy a cable package for one weekend of CIS sports? No one. But that's an oversimplification; Sportsnet wants to have another feather in their cap for people considering a subscription. They can market it: "NHL! NBA! MLB! CIS! We are your home for sports!" etc. But if Sportsnet wants to really push the CIS brand as selling point, then they have to make the whole product accessible because right now, I don't think the CIS is going to fire anyone up and influence their decision. They already cut OUA football and basketball because of viewership numbers. And if you do have a Sportsnet subscription, why would you go to a livestream? If the paywall is to drive people to TV, I don't think it will work. A game on television is better than a laptop, but are people deciding between the two, or using a livestream out of necessity? Honest question. Something else to keep in mind, more from a CIS perspective when negotiating the next TV deal: students are frugal with their money, even though they do have disposable income. Cost itself is a barrier -- we just don't want to take out a credit card and pay for stuff. So, a pop-up asking for money will likely turn off prospective viewers. Does anyone benefit from this? I think the CIS product is good and when I introduce it to people, they agree. The paywall prevents people getting introduced to the product and both parties just spin their tires from a public awareness standpoint. 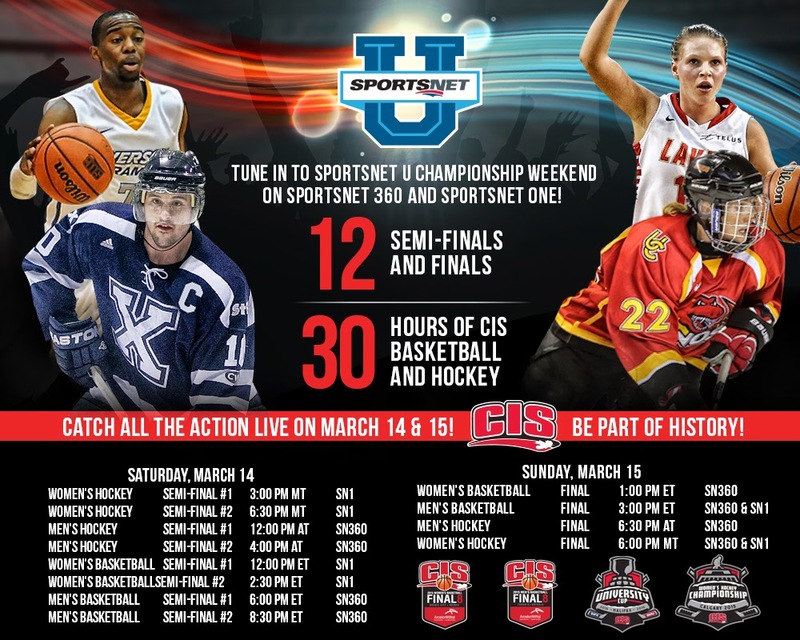 To move the CIS brand forward, Sportsnet's championships paywall should be reevaluated. I'd argue it is in Sportsnet's best interest to open up those games to introduce those who actually want to see the product and hope that people enjoy the games enough to make the CIS a marketable sports entity. The more I think about it, the less I think that a webcast has anything to do with reaching out to new fans, especially now that there is a stream available for just about anything. There seems to be this view around that if you put out a webstream that hordes of people are suddenly going to start watching. Webcasts have been prevalent in CIS for at least five years, almost entirely for free and it hasn't happened. If that weren't the case, everyone would be rolling in cash from the late, lamented SSN. In my SID days, I'm certain that I ran more than one webcast that nobody watched. Literally nobody. TV is a different story. That is a way to reach potential new fans. For a webcast, however, you have to search it out and make an active decision to go to it and watch what is certainly a poorer viewer experience than TV. The people who are going to do it are already your dedicated fans. Since advertising sales online are negligible, certainly for anything on the scale CIS has, I don't have a problem with asking people to pay for it. It is standard practice for collegiate teams in the states. I was not intending to make a comment on CIS webcasts in general. I'm not surprised to hear that nobody watched the webcasts .. I did radio broadcasts for McMaster basketball and the audio quality is so bad, I don't know why anyone WOULD listen or if they even did. I can assume those were regular season games and not the national championships though, and that's an important difference. Games are meaningful, opponents are perceived as "the best left standing" etc... If we were talking about a season-long broadcast plan, putting games on TV once a week and then charging for streams, I would agree with you. That can draw in new people. I think part of this comes down to a difference in who the CIS should be targeting. I think they should go after the people who are going to university right now. If they want to tap into that demographic, then TV's impact is much different. As I said, next to no one has a cable package in the student house. You can't create new fans through a medium they don't use. On the flip side, they could get more fans from the older generation. This isn't the group that advertisers are chasing, but the CIS can't really be choosers either. Any audience is an audience. Might be interesting to talk to the Alberta Golden Bears folks, they've had a pay barrier for their home football games for a couple of years. It would be interesting to see what they hoped to get out of the practice. Is it about off-setting the costs associated with production and streaming, as marginal as those dollars would probably be. Is it about trying to create demand at the physical box office, forcing fans to fill the seats instead of passively following along at home. Rogers' attitude about providing free content for non-subscribers is what drives their decisions. It would be interesting to see where the individual schools are coming when they do this type of thing. Cautionary tale from the 80s: The Argos thought they could improve their box office appeal by blacking-out many of their game. In an attempt to turn back the tide of the Blue Jays popularity of the era --the Bell, Mosbey, Barfield, pre-World Series days-- the Boatmen essentially marginalized themselves even more. Taking themselves off of TV and away from those who couldn't/wouldn't make the trek to Exhibition Stadium proved to be as emasculating to Canadian football in the GTA and Golden Horseshoe as any outside impact on the sports scene of the day.